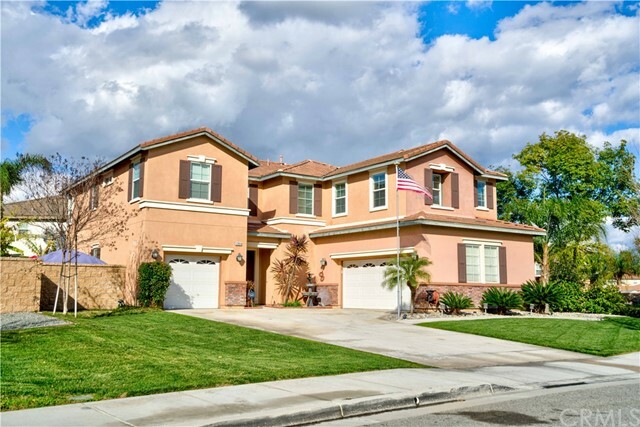 One of the Nicest Homes in all of Eastvale! Upgraded to the MAX! This Huge 3500+sq ft, 4bedroom 4 bath Home Needs Nothing! Some of the features include: Dual A/C Units, Remodeled Kitchen with Granite Counters, Ceramic Tile Flooring, Stainless Steel Appliances w/ Double Oven, Microwave & Cooktop, Center Island w/Sink Which Opens to the Family Room w/ a Gas Burning Fireplace and Built-ins for Media Equipment or Bookcase. There is a Downstairs Master Bedroom and a Separate Bath for Guests. The 2nd Floor has a Huge Room which is Being Used as an Exercise Room which can be a Family Room or Game Room! The Upstairs Master Bedroom has a Separate Retreat Which has a Dual Sided Gas Fireplace in Between the 2 Rooms. Master Bath has Separate Shower & Tub w/ Dual Vanities and a Spacious Walk-in Closet. There is also a 3rd master bedroom on the 2nd Floor along with a Hall Bath and Separate Laundry Room!Huge Corner Lot with Possible RV Access if Needed. Yard has is Concrete w/ Built in Fire Pit and a Large Side Yard with Grass which is Perfect forKids orPets! The Garage is Just Awesome w/ Epoxy Floor Color Coded to Match the Garage Paint Scheme with Speaker System installed!Great Home in a Great Location and Is in Pristine Condition!! !